There are some very good Thai restaurants in Bangkok, as you might expect. Here are some of our favorites. Kasma was once asked: “Do you have any suggestions for good eating places in Thailand? What do you think about the Baab Khanitha, Blue Elephant, Banjarong or Bussaracum restaurants?” Kasma replied that she’s not very enthusiastic about any of those. 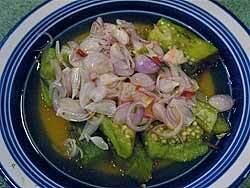 They are basically upscale, Royal Cuisine type places that cater largely to tourists. She ate at a similar type of restaurant last year because her driver said he dropped a lot of people off there and it was terrible. These sorts of restaurants that cater to tourists and are given lots of coverage in the guidebooks are the ones she tends to avoid. She prefers the more modest places with good food. Many are holes in the wall where you need to be able to speak or read Thai to get good food. Here are a few of Kasma’s favorites. There are two restaurants run by the same company with the name Mallika. 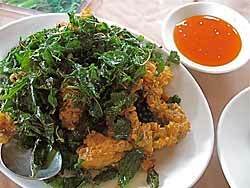 Our favorite, and where Kasma always takes her trips to Thailand is actually called A. Mallika. It is a large indoor and outdoor restaurant in the outskirts of town on one of the new highways where many large garden restaurants are located. It has a more extensive menu with unusual dishes not seen in any other restaurants; the food is also better and spicier since it caters mainly to Thai families with cars. Get the sour ribs. They also have a peppered ostrich dish that is good, as is the soft shell crab. Wonderful coconut ice cream. It’s address is 13/10 Moo 9, Kaset-Navamin Road, Boong Koom District, Bangkok 10230, Tel. 0-2946-1000. Check out the photos by a former trip member (click on the photos to see a larger version with caption). Also, check out Michael’s 2012 blog on the subject: A Mallika Restaurant in Bangkok. This is a fairly fancy restaurant, more so than A. Mallika, and a bit of a splurge (though still reasonable by US standards). It’s found in the Sukhumvit area, not far from the tourist hotels, in a romantic setting in an old teak mansion with a lush garden. It’s more expensive than A. Mallika, catering to upscale Thais and tourists. The address is 189 Sukhumvit 22 Road, Klongtoey, Bangkok 10110, Tel: 662 663 3211 2. It is a challenge for taxi drivers to find! Here’s the restaurant’s website — there’s a map you might want to print out to help you get there: www.ruenmallika.com. One of Bangkok’s oldest Thai restaurants, located not far from the Democracy Monument on Radjadamnoen Blvd. is Sorndaeng (possibly spelled Sorn Dang). It’s upscate, expensive and has a stiff mixture of western colonial and Thai Royal ambience that may make the casual diner feel a little out of place, but the food is excellent and menu extensive. It’s stayed in business as long as it has because of its impeccable service and the high quality of its food. Another one we like is Taling Pling, at 60 Pan (or Pun) Road, Silom – it is on one of the sois just off Silom road – I think it is Soi 20, but may be wrong: it is the Soi that has the Hindu temple at the corner. However, they tend to tone down the food for foreigners, so it’s best to go with a Thai or learn to communicate with the staff that you like really spicy, full-flavored authentic Thai food. 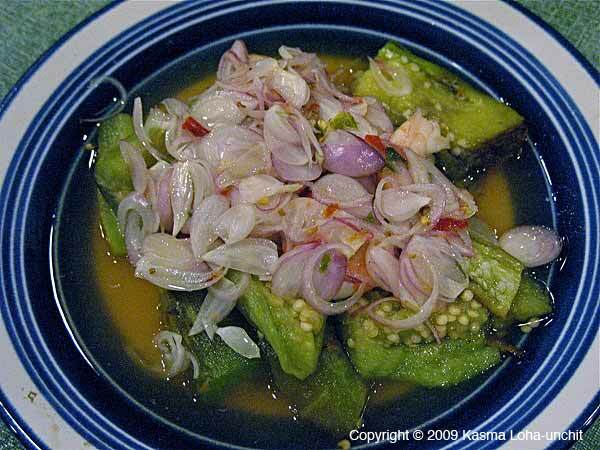 One of their specialties is Miang Taling Pling – taling pling is the name of a tart fruit that gives the restaurant its name and is used in many of their dishes when it’s in season. Address: 60 Tanon Pun, Silom, Bangrak, Bangkok. Phone: 02 236 4830, 02 234 4872. 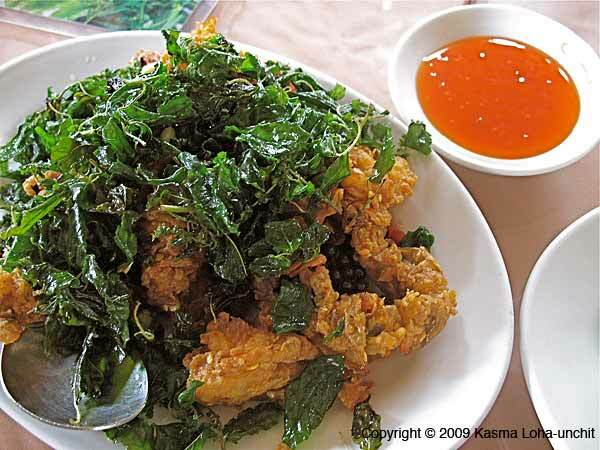 You might enjoy seeing Kasma’s Thai food photo sampler. I’ve also written an article on Eating Out In Thailand. Written by Michael Babcock, June 2009. This entry was posted on Saturday, June 6th, 2009 at 12:01 am	and is filed under Food, Restaurant, Travel. You can follow any responses to this entry through the RSS 2.0 feed. You can leave a response, or trackback from your own site. Searching more than this submit reminds me involving my cousin! I am going to ahead this precise write-up for you personally to him or her. I agree that My Choice restaurant although it lacks in appearance the food was great. I really love the coconut crab dip (sorry don’t know real name). is the food Center near Ambassador Hotel still open. Being 12 yrs since I never went back, but that was a great food. That was a great food court. Amazing food from varied origins. If it’s still opened: is the quality of food still stellar? PS: I miss Bangkok a lot. You don’t mean the food court but the small horseshoe side street off soi 11. Yes, few good restaurants are still there. Ruen Mallika is a rambling, two-storey wooden house with a nice garden. There are two option on what location to celebrate, whether it is inside, or outside with a beautiful scenery of a people made garden. I love the ambiance and like to be there with my honey bunch and feel the love. 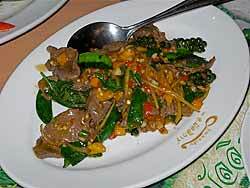 A. Mallika is an authentic Thai cuisine, the food they served is best! I don’t know if it is related to mallika in washington, they serve best desert, and this includes shakes like blueberries, raspberries, blackberries, strawberries, and chocolate sauce. “My Choice Southern Chicken Curry” – this is not just like a regular chicken curry; its special! Absolutely very special, though the place is not as pretty that much but the food they serve is delicious. The Southern Chicken Curry is a dry curry, and very spicy. Although when most people think of Thai curries, they think of the coconut milk based curries, there are other types as well. 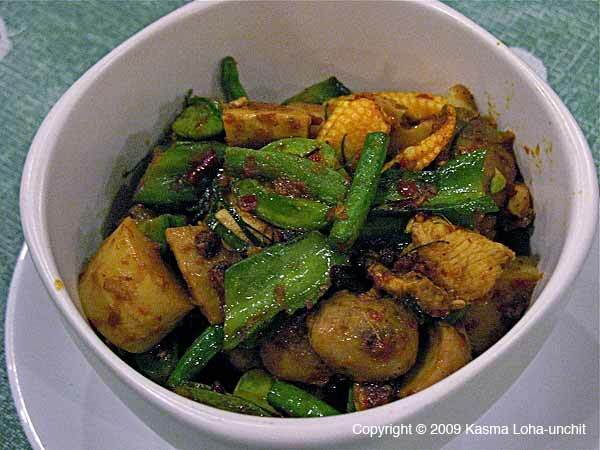 Kasma’s blog post on Thai Curries – Gkaeng is an interesting read. I like the sounds of Talin Ping on silom. im gonna go and take a trip to that one and give it my review. Thanks for the info and keep up the excellent work. Much appreciated! Taling Pling on silom branch is one of the best food chain when it comes to spicy and full-flavored authentic Thai food. This Restaurant price information is based on meal cost per person, it made me easy to pick on my pocket, good serving. Thanks for all the useful information I found on your site. I will bookmark and visit again. I found you while doing a search for “travel guidebooks”. Your site was most helpful in my research….